Carla only has faint memories of her mother, but before she marries her fiancé she is determined to clear her late mother, Caroline Crale, in the fatal poisoning case of her father, famed artist Amyas Crale. Though neither Caroline nor Amyas were far from perfect, Carla is convinced someone else was involved. 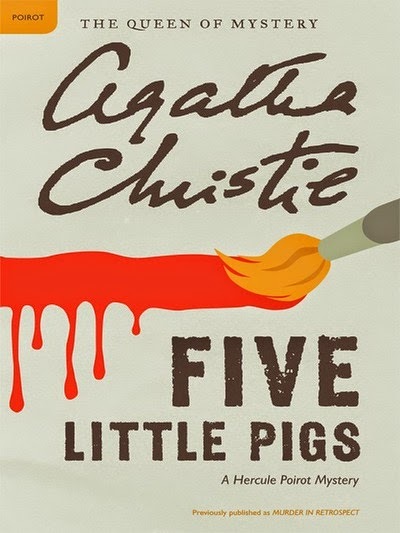 When Carla pleads with Hercule Poirot for his detective intervention, he discovers that there are “five little pigs” who had their own possible motives for killing Amyas and framing his wife for the murder: stockbroker Phillip Blake (who “went to market”), his sister Meredith, an herbalist and recluse (who “stayed at home”), wealthy socialite Lady Dittisham (who “had roast beef”), overlooked and put-upon governess Cecilia Williams (who “had none”), and Caroline’s victimized younger sister, Angela Warren, who still bears the disfiguring scar Caroline gave her years earlier (who cried “Wee! Wee! Wee! all the way home”). As always, Agatha Christie’s narrative does an exceptional job keeping readers questioning whodunit as chapter after chapter keeps not just one but several suspects at the top of the list. Her partiality to nursery rhymes in no way demeans or simplifies the complicated dynamics between suspects and their alibis, motives, and lingering secrets. At the novel’s conclusion, Poirot’s discovery is a satisfying end to the case as readers see how revenge casts a long shadow on even the best fairy tale endings.